JUPITER, Fla. - The Florida State League has released its players of the week, and pitcher, Jimmy Reed received one of those honors. 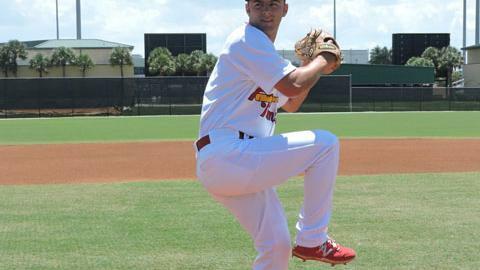 Reed, a left-handed pitcher from Gaithersburg, MD, received Pitcher of the Week, after pitching a complete game on Friday, May 22 against the Clearwater Threshers. That was his second nine-inning complete game of the season and third in his career. In his first seven starts of 2015, Reed has collected a record of 3 - 2, posting a 2.47 ERA. He's thrown 47.1 innings, allowed 40 hits, 13 earned runs, and struck out 29. In one of those starts, a rain delay occurred after he completed just 3.1 innings. Palm Beach's record is 5 - 2 when Reed starts the game. Reed is scheduled to make another start this Friday, May 29 against the Tampa Yankees in Tampa. His next probable start at Roger Dean Stadium will be on June 4 against the St. Lucie Mets. To purchase tickets, please call (561) 630-1828 or visit RogerDeanStadium.com.